One effective, if unofficial method for keeping Nextcloud current on Linux servers is by configuring your system to use Nextcloud via a self contained “Snap” package, A technology allowing users to always have the latest version of an “app”. That version from Canonical is quite restrictive. It is not aimed at developers or advanced users who would want to tune their configuration by installing extra features. It is aimed at end-users who want a no-brainer solution. Install it, use it. No need to worry about updating Nextcloud any more. It will work for as long as Canonical pushes releases, just like with any other Linux package maintained independently of Nextcloud. After a successful install, assuming you and the device on which it was installed are on the same network, you should be able to reach the Nextcloud installation by visiting .local in your browser. If your hostname is localhost or localhost.localdomain, like on an Ubuntu Base device (IoT), nextcloud.local will be used instead. Do not use on IoT devices yet. You probably don’t need these instructions anyway if you’re using Snappy Base 16.04 as it’s currently unreleased. 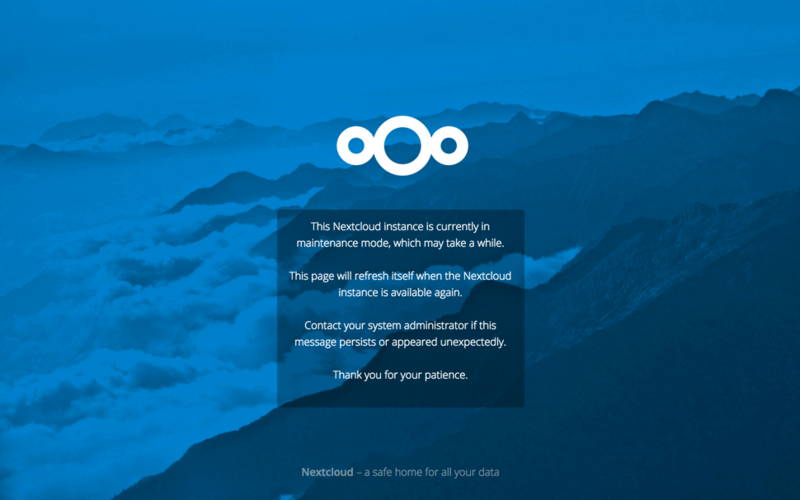 Take your Nextcloud server out of maintenance mode. Your Snap package manager only upgrades the current Nextcloud Snap. Then your Nextcloud server is immediately put into maintenance mode. You may not see this until you refresh your Nextcloud page. You’ll find previous Nextcloud releases in the Nextcloud Server Changelog. If upgrading via your Snap package manager fails, then you must perform a Upgrade manually.